Stranger's fire was kindled in 1948 in a brainstorming session between Robert Heinlein and his wife, Virginia. While looking for material to fit John Campbell's title, 'Gulf,' Mrs. Heinlein thought it would be interesting to explore the case of a human raised by Martians. Heinlein thought that the idea would make a pretty good Lettres Perses–type novel, took some notes and filed it away for later use, finally placing the completed but abridged version with Putnam's in 1961 (an uncut edition was released in 1991). 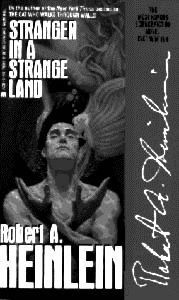 Stranger in a Strange Land tells the story of Valentine Michael Smith, orphaned progeny of the first manned expedition to Mars, who has been raised by Martians and brought back to Earth by a second human expedition. Though he is a man in his twenties, Smith looks at absolutely everything on this new planet through the ignorant eyes of a baby, and faces the job of learning how to be a human being. If the world government of Earth will let him, that is, for Smith, through a legal fluke, not only has sole survivor rights to the space drive that his mother invented, but also to the surface of Mars. In a Byzantine maneuver that makes Watergate seem minor, the government holds Smith hostage while it tries to figure out how to seize his assets. Ben Caxton, a muckraking reporter, suspects the worst and attempts to rescue Smith. The problem is, if you can't fight City Hall, how can you even begin to fight a world government? Enter Caxton's friend, Jubal Harshaw, attorney, physician, hack writer, bon vivant, curmudgeon, anarchist. He caches Smith in Freedom Hall, his Poconos enclave, and takes on the dual chore of fighting the world federation for Smith's liberty and of educating Smith in the ways of his biological race. The youth is an apt student, a strange admixture of human infant and Martian superman, and as time goes on, he manages to win more and more people over to his own alien viewpoint. He becomes a kind of messiah–with explosive results.